Teaches the highly acclaimed "Top Half"
developes a level swing plane. trains like this innovative new product! on the off speed pitches. pitches of all speeds and off speeds. Order two and double your batting practice. Zip-N-Hit Pro acts like a portable batting cage, allowing batters to improve their swing almost anywhere. Players have fun while developing confidence and power. As much fun to "pitch" as it is to bat. Improve hitting skills while increasing bat speed. 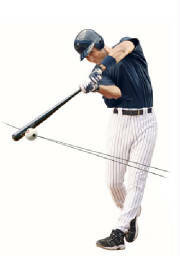 Learn "top-half" hitting while reinforcing a level swing. Practice hitting pitches of different speeds and movement. Comes with an attachment clip and strap, for easy attachment almost anywhere. Effective training device useful for high school and collegiate use. Do Not Delay! Order Now!